Cranes continue to play a major role in the rental construction equipment market in Saudi Arabia, according to a TechSci research report. The report said growth in the construction sector coupled with easy availability of construction equipment on rent was set to drive the kingdom’s construction equipment rental market through 2020. The construction sector in Saudi Arabia is witnessing continuing growth, which is translating into rising demand for construction equipment in the country. Due to high acquisition costs of construction equipment, construction companies prefer procuring equipment on rent. The country’s construction equipment rental market is broadly segmented into six major categories including crane, excavator, wheel loader, bulldozer, motor grader and telescopic handler. “Cranes, followed by excavators, dominate Saudi Arabia construction equipment rental market. 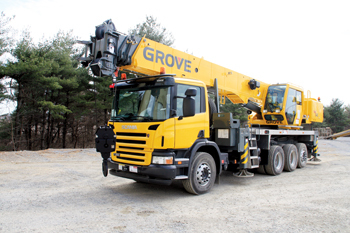 Crane rental segment is projected to dominate the market in terms of revenues through 2020, owing to their large fleet and essential requirement in construction activities. However, telescopic handlers segment is expected to emerge as the fastest growing category due to its use in multiple applications in the construction sector,” said Karan Chechi, research director with TechSci Research, a research-based global management consulting firm. Construction equipment rental companies such as Bin Quraya, Zahid Tractor & Heavy Machinery Company and Industrial Supplies Development Co are a few of the leading players in Saudi Arabia’s construction equipment rental market. JCB, Tadano, Liebherr, Caterpillar and Grove, among others, are the major equipment brands offered by these rental companies through customised rental agreements in the kingdom. The south-west and north-central regions account for over 70 per cent of the country’s construction equipment rental market, with major demand emanating from the cities of Makkah, Madinah, Riyadh and Hail, the report stated. “The report is intended to provide cutting-edge market intelligence and help decision-makers take sound investment evaluation. Besides, the report also identifies and analyses the emerging trends along with essential drivers, challenges and opportunities available in Saudi Arabia’s construction equipment rental market,” Chechi said.